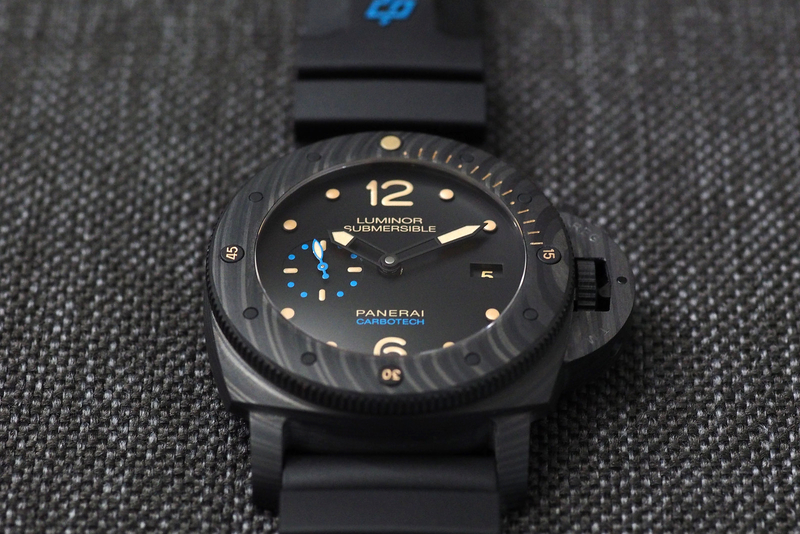 First developed in the late 1940s, the original Panerai Luminor was made to be worn by commandos of the Italian Navy. And then for the Egyptian Navy in 1956, which eventually inspired the Luminor 1950 design. The Luminor Submersible 1950 47 mm, is a more robust professional 300-meter version of the Luminor 1950. In January, at SIHH 2015, Panerai debuted the Luminor Submersible 1950 Carbotech 3 Days Automatic 47 mm, made with a new high-tech material designed to for its unique aesthetic and performance characteristics, called Carbotech. According to Panerai, Carbotech is both lighter and stronger than ceramic or titanium, as well as being hypoallergenic. No two cases are the same due to each layer being compressed in a non-uniform pattern, so in addition to performance benefits, each piece is visually distinctive from one another. As the name suggests, Carbotech is a composite material based on carbon fiber. It has an uneven, matte black appearance, which varies according to the cutting of the material. Thin sheets of carbon fibers are compressed at a controlled temperature under high pressure together with a high-tech polymer PEEK (Polyether Ether Ketone), which binds the composite material, making it stronger and more durable. Carbotech is utilized in the case, rotating bezel, crown, and the lever bridge, which protects the crown. Notably, the lever bridge, a signature feature on Luminor models, consists of a patented crown guard and a lever that holds the crown in place so as to prevent water from entering the case, without the need for a locking crown. Basically, when the lever is locked down, it pushes against the crown so as to prevent it from moving. The only issue I had with the design, is that the crown bridge makes it a bit harder to manually wind the if it had a standard crown. Having said that, if you want the signature Panerai crown bridge look, this is an inherent part of the design. Thanks to the lever bridge (locking crown guard), gaskets seals, and the screw-in blackened titanium caseback, the Luminor Submersible is water resistant to 300 meters, which is three times the 100 meters required by the ISO 6425 dive watch standard. And even though there is no helium escape valve, this is still a highly professional dive watch, although I’m sure its appeal will be more for leisurely divers than for professionals. The rotating bezel has markers that Panerai refers to as “small studs” which allow the wearer to calculate immersion time, and can only rotate counterclockwise for safety (so it cannot be accidentally reset). A large stud at zero is treated with a luminous material, and the first 15-minutes are marked by luminous engraved indexes, with additional luminous studs at 15, 30 and 45. With strap attached, the watch weighs 135.5 grams. This is light relative to the considerable dimensions of the case (47 mm diameter x 16.8 mm thick x case 57.5 mm in length). The distance in between the lugs is 26 mm. A black dial with a matte finish perfectly coordinates with the surfaces of the case, which are also completely matte. Large, applied luminous dots mark the hours, with the exception of printed luminous Arabic numerals at 12 and 6 o’clock, that punctuate the clutter-free dial. Oversized, black, luminous, skeletonized hour and minute hands indicate the time, along with the subsidiary small seconds display at 9 o’clock. A blue hand is filled with luminous material and continuously circles the small seconds subdial — with blue dots, and luminous indexes marking 15-second graduations — every 60 seconds. A rectangular aperture at 3 o’clock displays the date. A slightly convex sapphire crystal, that protrudes just above the bezel, protects the dial. Hours, minutes, small seconds, date are indicated on the dial, as well as the calculation of immersion time via the uni-directional rotating bezel. The dial is uncluttered and features big, bold markers and hands, so it is easy to read — even in low light, thanks to the generous application of the luminous material. Any good watch should be easy to read, but when it is a professional dive watch, good legibility becomes a prerequisite. In fact, the ISO 6425 dive watch standard explicitly requires this, which is especially important underwater. The Panerai Carbotech is powered caliber P.9000, an in-house automatic movement, which runs at 4 Hz and consists of 197 components, including 28 jewels. 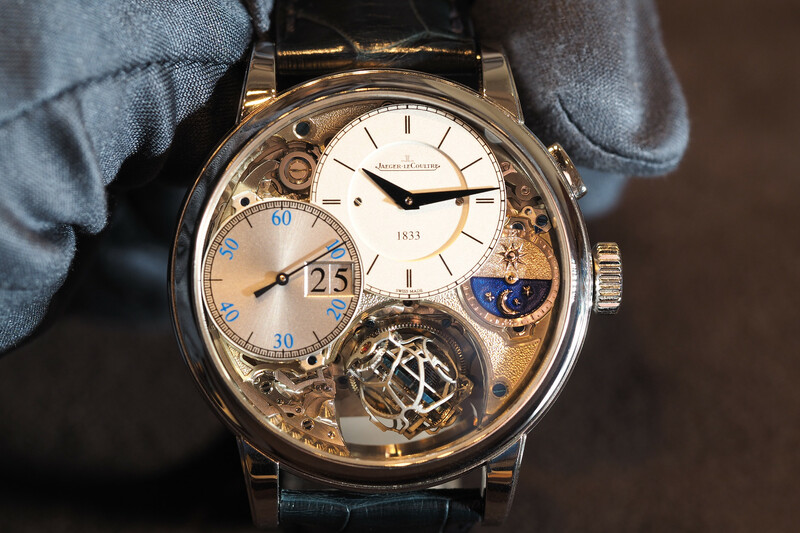 Although it is covered by the solid caseback, the automatic rotor is skeletonized, and the watch has been decorated with a unique brushed finish. 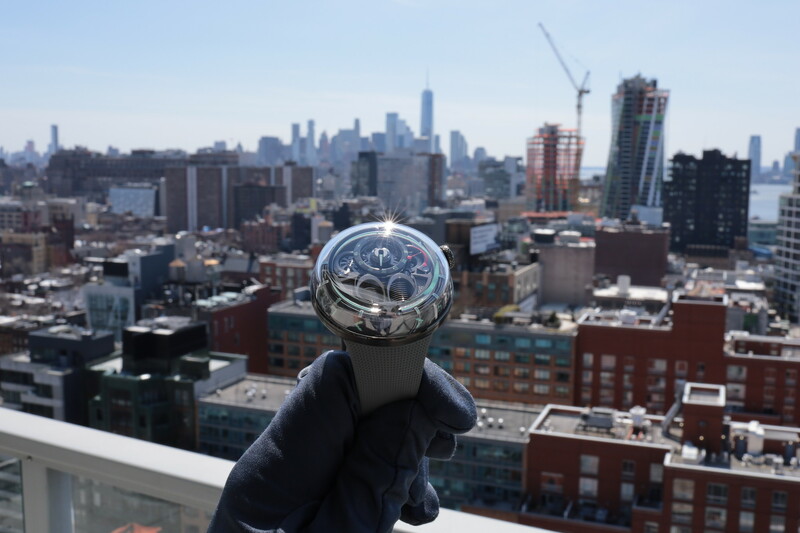 Thanks to two mainspring power barrels, the watch can run autonomously for three days (72 hours). A single-piece rotor winds the movement by moving in both directions thanks to an automatic ratchet device. Although you can not see it because the caseback is solid, the balance wheel is free sprung and adjusted via screws. The P.9000 caliber was created entirely by Officine Panerai and is used in multiple Luminor 1950 and Radiomir models. To ensure accuracy when setting the time, the movement includes a device that stops the balance wheel while the hour hand moves forward or backward in increments of one hour without interfering with the progress of the minute hand. Functions include hours, minutes, small seconds, and date. The black titanium caseback is engraved “Florence 1860”, the city and year of birth of Panerai watchmaking, and the image of a Slow Speed Torpedo (SLC), the notorious “pig” on which in the 1940s the commandos of the Italian Navy sailed through the depths of the sea on their missions while wearing instruments made by Panerai. Identified by the reference PAM00616, the new Luminor Submersible 1950 CarbotechTM is fitted with a black rubber strap, personalized for the first time by the OP logo in Panerai blue. All of the luminous material has an artificially aged (tan) color which goes along with the vintage-inspired 1950s theme. On the wrist, the watch is chunky (by design), and while you can feel the weight, at no time did it feel too heavy or uncomfortable. 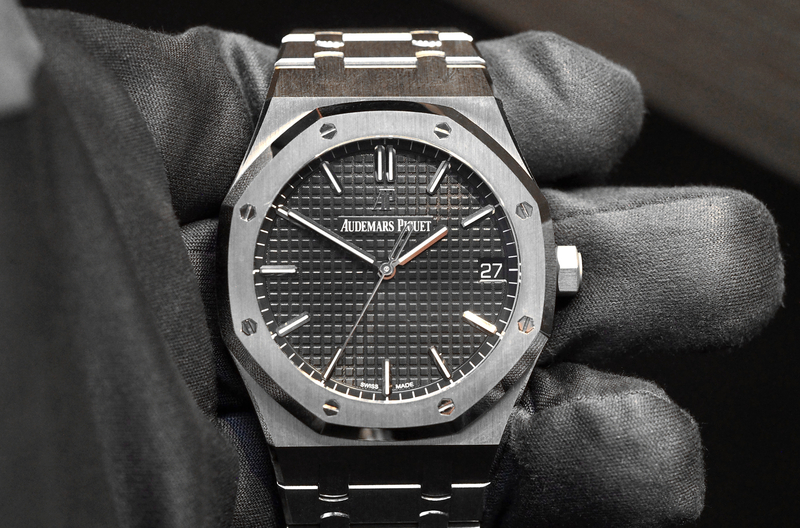 It is large in a good way, and it is definitely not for anyone who hates big watches. Compared to other oversized watches I have worn, the smooth edges and overall ergonomic design results in an enjoyable wearing experience. The Panerai Luminor Submersible 1950 Carbotech 3 Days Automatic comes with a black, accordion-style rubber divers’ strap that is 26 mm wide at the lugs and 22 mm at the buckle. It fits great and is easy to unbuckle, moreover, there is a quick-release strap feature, activated via a button on the back on each lug, on the left side of the caseback, making it easy to switch to one of the optional calf or alligator straps made by Panerai for this model (or a plethora of aftermarket straps). Additionally, the lugs are pierced, which makes it easy to remove the strap by pressing the spring bars with a tool from the side as well. The Luminor Submersible 1950 Carbotech 3 Days Automatic is a deep dive watch powered by a robust manufacture movement that lasts an impressive 72-hours. It has the benefits and looks of a professional dive watch, with an aesthetic similar to black ceramic or titanium, yet it is stronger, lighter, and more corrosion resistant. And most importantly, in my opinion, each case has a unique grain to it, akin to different patterns found in natural products such as Carrara marble or Macassar wood. The combination of the cutting-edge Carbotech material, with the signature Luminor styling, highlighted by the carbon lever bridge, makes a very compelling proposition – even if you already have a Panerai. Furthermore, if you want a black watch that truly stands out from the homogeneous finishes seen on the majority of black watches – then this is a great choice as each case is one-of-a-kind. The Panerai Luminor Submersible 1950 Carbotech 3 Days Automatic 47 mm (Ref. PAM00616) is available in stores now for $17,100.